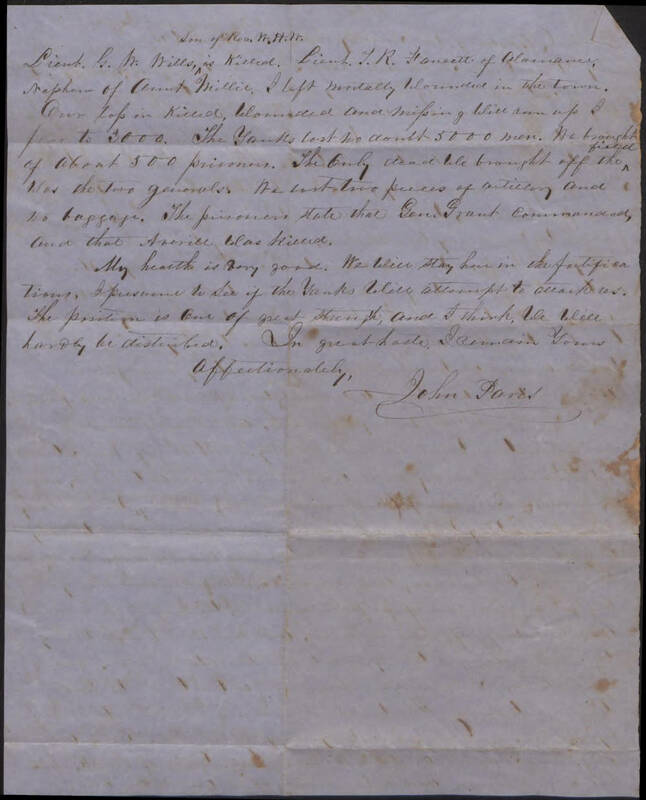 Item Description: A detailed letter from John Paris to his wife describing The Third Battle of Winchester. Citation: From Folder 5, in the John Paris Papers #575, Southern Historical Collection, The Wilson Library, University of North Carolina at Chapel Hill. My Dear Wife, The bloodiest battle I have ever witnessed according to number, was fought by us yesterday at Winchester. Our men fought like they intended to die rather than yield. The Yanks attacked us at daylight with overwhelming odds Commanding and Sharp Shooting continued until half past ten. when the Yanks advanced their line of battle. The most furious artillery fight ever looked upon raged until half past eleven, when the action became general. Both parties fought without any breakthroughs, the enemy being the awaiting party. I looked upon the scene with sorrow and joy. About 12 our line gave way, fell back about ten hundred yards, and assessed the line; the Yanks advanced but the steady aim of our line was such that the ground was totally covered with Yankee dead, at length the enemy gave way. They fled in disorder and our line advanced and occupied the enemies position. I though the victory complete, and engaged in assisting in carrying our wounded into the city. About half past 2 O’clock the Yankee Cavalry made a demonstration on our left; and Imboden’s Brigade of (Buttermilk rangers) Cavalry, without any cause gave way without fighting, and came shouting wildly through the streets crying out the Yankees are coming. This started waggons, ambulances, carts, niggers, boys, skulkers and many others to flying in a push of perfect confusion, without sense or reason and and taking off like a storm, and our dear fought victory was lost. General Early had to fall back to this place, giving up the town. I reached here last night as our One Oclock with the baggage trains. The troops marching at liesure will be here by noon. Our life is truly dreary. Major Gen. Rodes, and Brig. Gen. Godwin are both killed. Col. Ellis of the 34th has his arm shortened a few inches of the bone taken out. Lieut. G. W. Wills, son of Rev W. H. W. is killed. Lieut. T. R. Hanett of Alamance, nephew of Aunt Millie, I left mortally wounded in the town. Our loss in killed, wounded and missing will sum up I fear to 3,000. The Yanks lost no doubt 5000 men. We brought of about 500 prisoners. The only dead we brought off the field was the two generals. We lost two pieces of artillery and no baggage. The prisoners state that General Grant commanded, and that that ?? was killed. 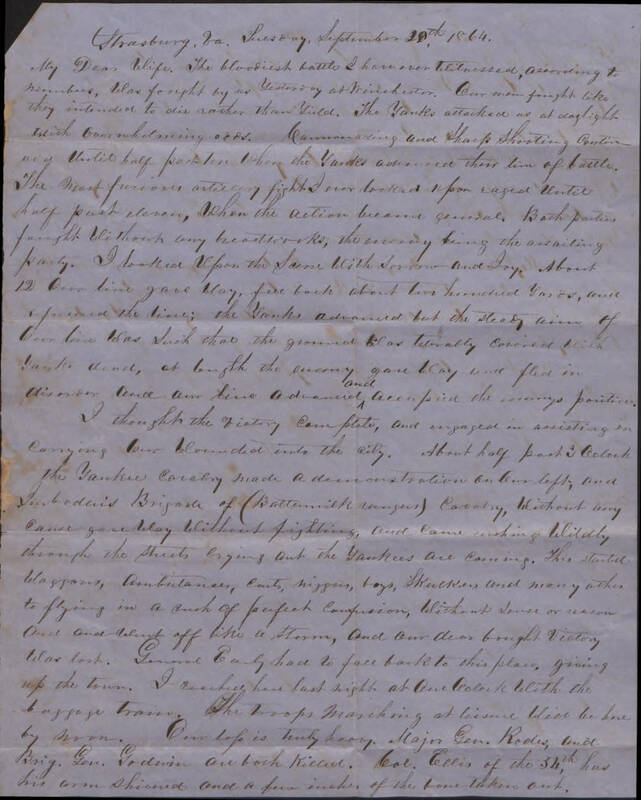 This entry was posted in Southern Historical Collection and tagged battle, Buttermilk Rangers, Civil War, General Early, John Paris, Major General Rodes, Southern Historical Collection, The Third Battle of WInchester, Virginia. Bookmark the permalink.